An FIR was lodged against Bollywood superstar Salman Khan and Shilpa Shetty Kundra on Saturday at Andheri Police station, for allegedly using the word "bhangi" on a public platform that hurt the sentiments of the Scheduled Caste community. 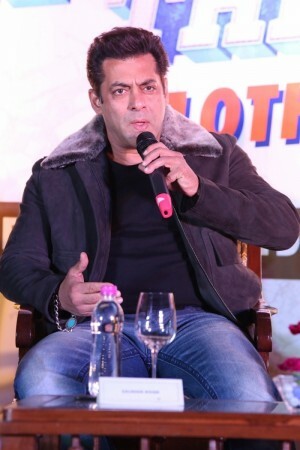 Confirming the news, Vice President of Rojgar Aghari Republican Party of India, Kishore Masoom, told IANS on phone, "We highly condemn Salman Khan and Shilpa Shetty for using such words that show us in a bad light. We have filed a complaint and will hold a protest in front of Galaxy Apartment, Salman's house today. According to law, he has to serve an imprisonment of five years." Asked if he thought Salman Khan who has a huge fan following would get bail easily, Masoom said: "No one is above the law, whether a normal public or a celebrity. And talking of his fans, only the elite people did not make him 'Salman Khan the Star', even Dalit people like us also watch his films. Who will support a man who is so disrespectful towards his fans? We are hurt." The complaint has been lodged by Navin Ramchandra Lade, General Secretary of Rojgar Aghari Republican Party of India. The statement released by Lade's lawyer reads: "Salman along with Katrina Kaif on a TV show used the insulting word 'bhangi' against a member of the Scheduled Caste." "Actor Shilpa Shetty stated in an interview 'I look like a bhangi' - it appears from her statement that she is encouraging and spreading ill-feeling among the entire society. He also intentionally insulted members of the Scheduled Caste. Both actors have committed an offense under sections of the Scheduled Castes and the Scheduled Tribes (Prevention of Atrocities) Amendment Act, 2015, and Protection of Civil Rights Act, 1955." Lade added: "I felt insulted and humiliated. Being a member of the Scheduled Caste, I feel very pained and hurt due to an insulting statement made by Salman Khan and Shilpa Shetty." The FIR comes a day after members of the Valmiki community in Rajasthan filed a complaint against the star in Jaipur for using the pejorative word. Massive protests were held against Salman Khan starrer "Tiger Zinda Hai" on Friday, with Valmiki community members disrupting the film's screening in cinema halls across the state on Friday in protest against the alleged use of a pejorative word by Salman. Members of the Valmiki Yuva Sangathan lodged a complaint at the Nahargarh police station against Salman Khan and Shilpa Shetty for the use of word 'Bhangi'. The protesters alleged that Salman had insulted the Valmiki community by using "cheap language". The video of Salman, uttering the pejorative words has gone viral and triggered tension in Ajmer. In Kishangarh, Rajasthan, Salman Khan's effigy was burned.